And really enjoy the journey? This is an important moment in the field of personal development. Today I am pleased to present one of the finest, most complete works of personal growth information available anywhere. 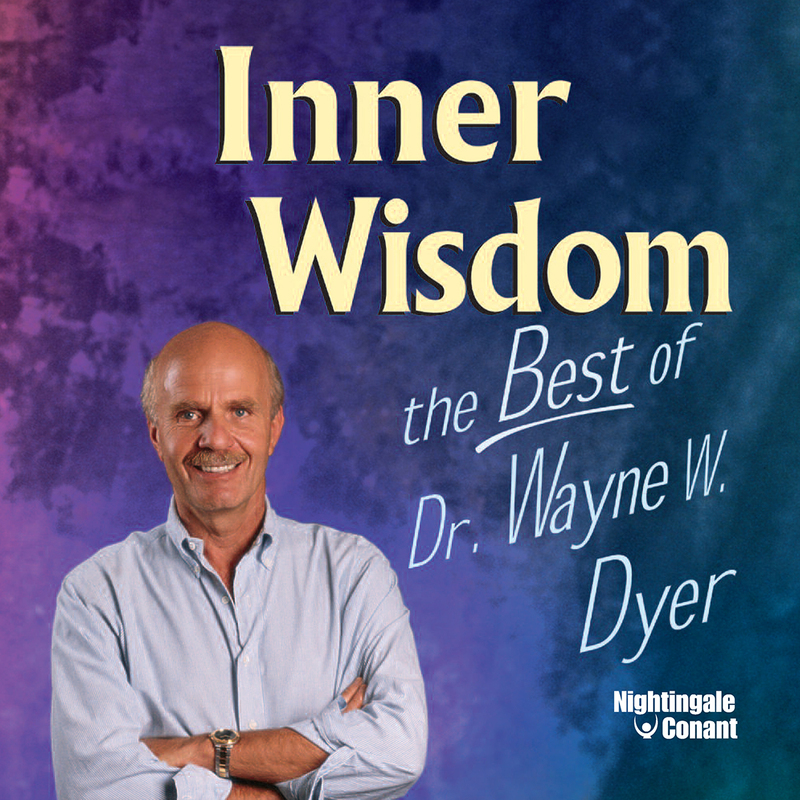 Inner Wisdom: The Best of Dr. Wayne W. Dyer will open up new possibilities for your mind, health, emotional well-being, relationships, and spirit — and we guarantee it! This remarkable 10-volume anthology of Wayne Dyer's most inspired work spans 25 years of his brilliant career! Now you can use it to inspire yourself… to grow and change… and to experience true satisfaction and fulfillment as you travel the journey called life. Anything is possible with Wayne Dyer as your guide! I hope you are ready to believe that anything is possible for yourself and for the world. Because Wayne Dyer's philosophy and body of ideas are so full of enthusiasm and belief for all that is possible — well, there's just no room for doubt! This spectacular collection of recordings spans Wayne Dyer's evolving philosophy of personal, emotional, and spiritual development. Long viewed as a pioneer and leading explorer of human development, Wayne Dyer is joined in this program by some of today's most well-regarded authors and speakers, who have recorded special introductions to each volume. They include Deepak Chopra, Joan Borysenko, Marianne Williamson, and many others who consider Wayne to be a guiding force in the field. Here you'll find hundreds of ideas that you can use to make immediate, positive changes in any aspect of your life — in all, 10 major topics are covered. This program provides a lifetime of groundbreaking information. It's a program you'll turn to again and again… and you'll find new insights each time you listen! From using the power of your thoughts to virtually create the kind of life you want…to finding the blessing and gift in every experience… to moving beyond conflict in all your relationships… this complete audio collection will direct you toward more fulfillment at home, at work, and on the adventure trail of life. At the same time, you'll shed negative beliefs and emotions, arriving at true peace of mind in every moment. Join Wayne Dyer as he shares his life's work. These carefully compiled recordings contain ideas that have changed the lives of millions of people throughout the world. Now, they can be forever yours to enjoy and share with friends and family. With Wayne Dyer as your guide, life becomes an exciting journey filled with positive, wondrous possibilities! Inner Wisdom brings you illuminating ideas that open new possibilities every time you listen! At the same time, it slams the door on limitations like doubts, fears, and negativity! Discover how to use your thoughts to create abundance, conquer the aging process, create everyday miracles, and solve difficult problems… all on Volume 1! On Volume 2, you'll find the keys to really living the life YOU want, to finding and living your purpose on this earth, and to freeing yourself from concern about other people's opinions and judgments of you. Move beyond the negative. No more complaining. Mistakes don't exist. Failure is wonderful. How to view anger, criticism, doubt, and more. It's all on Volume 3! Volume 4 provides the perspective needed to really enjoy life's experiences, no matter what they are. The gift of enjoyment and happiness can be yours! The present moment is too valuable to waste on doubts, fears, or worries. Gain the confidence to take risks, to be a doer, to move past painful experiences. The keys to living each moment to its fullest are yours when you listen to Volume 5! On Volume 6, Wayne Dyer explains the difference between believing and knowing. This spiritual perspective is imperative for anyone who wants to prosper from universal intelligence. Become a spiritual being. Understand the true nature of thought. Go through the gate to a spiritual existence and find a whole new level of life experience. Fascinating insights on living from your highest self are presented on Volume 7. With higher awareness, you begin to identify with that which is changeless and eternal. You learn to be a witness. You gain acceptance and appreciation. You soar! It's all on Volume 8! One of life's greatest sources of stress is unresolved relationships. But relationships can also bring us our greatest joys. On Volume 9, you'll learn the keys to moving beyond conflict. Wayne Dyer's ideas about relationships are fresh, original, and life-enhancing! A life worth living is a life that enriches and enhances other people and the world. When you set out to make a difference, you'll find that happiness chases you. Volume 10 explores important issues like unity, truth, beauty, love, intention, and ethics. My affiliation with Wayne Dyer goes back many, many years. In fact, my father first began to publish Dyer's recorded work almost 25 years ago. I've seen thousands of letters come to my company from people whose lives have been forever changed by this man. I recently asked Wayne to describe the evolution of his ideas over the years. I think his answer will reveal much about this incredible man… and give you important insights about the ideas and inspiration contained in his incredible program Inner Wisdom. Every message, every idea, and every piece of practical advice in this program will speed you toward the life you've always wanted for yourself. It's all here, just waiting for you. I truly believe you'll decide that this is a one-of-a-kind opportunity to experience some of the best information available for your personal, professional, emotional, and spiritual growth. by Dr. Wayne W. Dyer. I want to create the life I've always wanted for myself!